A Stroll Thru Life: Chocolate Anyone ? Does chocolate make you think of cooler temperatures? I've got company coming and I'm planning and thinking Thanksgiving, how about your? Here's a little sneak peek at what I'm working on. Beautiful pillows and I love those candleholders. Hi Marty! 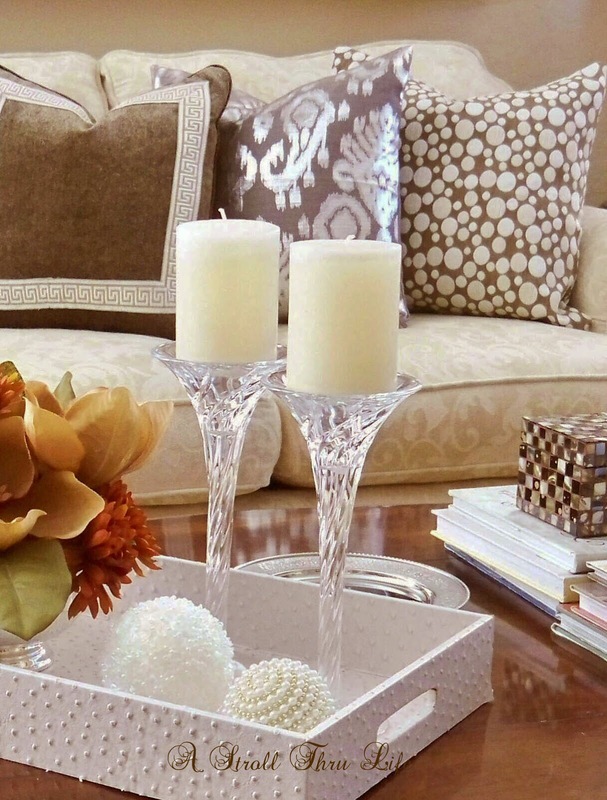 I love those pretty pillows and your display on the coffee table looks so elegant. I just bet you're getting all ready for your company and Thanksgiving. You are so organized. Wish you lived close to me as I would really get your advice on what to do in my living room. You know just how to make everything so beautiful! Hope you've had a nice weekend and thanks for popping in to see me. The candleholders are gorgeous and those pearly balls are so, so beautiful! Have a wonderful week Marty and thanks so much for coming to link up with us this past Thurs! I love the pillows Marty, and I love the chocolate color. It's such a pretty color for this time of year. I love your coffee table vignette too. You always have the BEST pillows. I too love chocolate. Love those pillows Marty esp. the one in the middle. I'm a self-confessed chocoholic, so I can't wait to see if you'll be sharing some yummy chocolate recipes! There's nothing more delicious than chocolate! Never mind if it's cold or warm outside, the chocolate is so yummy! I love your choice of fabrics, dear friend!!! WHITE chocolate is my favorite!!! Thanksgiving will be low~key as we host Christmas On Crooked Creektt this year. Looking forward to Inspire Me Tuesday! Just gorgeous Marty, I love your pillows and that tray!! I love the chocolate color. Your pillows and table are beautiful. Your company is going to be so impressed with your pretty styling for Thanksgiving. That will be here before we know it!!!!! I love those candle holders. They are awesome. Love the pillow and the colors are perfect...I don't have to worry about Thanksgiving this year....We will be in your neck of the woods at my SIL's.